1. In small saucepot, heat milk over medium heat just until it simmers. 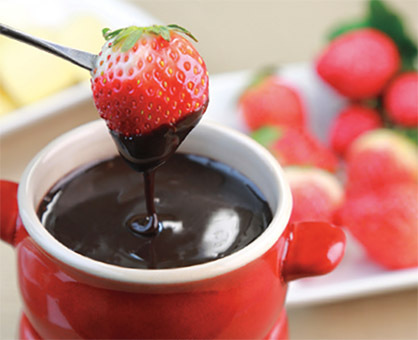 Add chocolate to fondue pot; pour hot milk over chocolate. Let stand 3 minutes; add brandy and whisk until smooth. Makes about 5 cups. 2.Place fondue pot over medium-low flame. Add additional milk if it gets too thick. 3.Serve immediately with sliced apples, sliced pears, mini-marshmallows, whole strawberries, 2-inch pieces of bananas, pineapple chunks, pretzels and/or pound cake cubes. Toss apple or pear slices with a little fresh lemon juice to prevent browning.